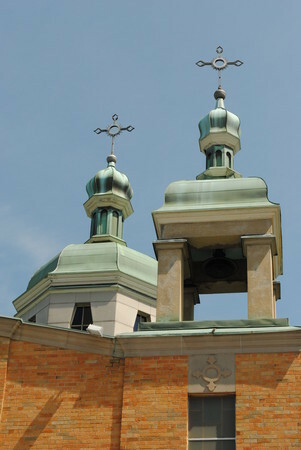 The parish of St. Andrew was formed in 1954 and draws people of the Orthodox faith, both of Ukrainian and non-Ukrainian heritage. Worshippers give glory to the One God, Father, Son and Holy Spirit. The faithful of the parish seek a close and personal relationship with Jesus Christ through prayer, divine services, reading of Sacred Scripture, reception of the sacraments, fasting and acts of charity. 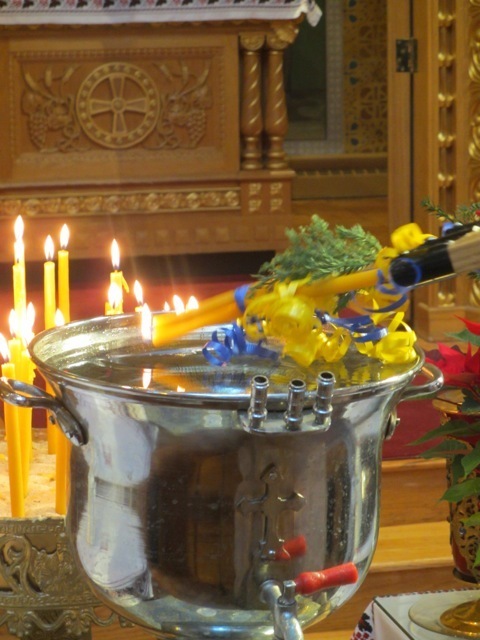 It is the intention of its parishioners to remain faithful to the Sacred Traditions of the Holy Orthodox Church as well as to the customs of the Ukrainian Church. As Christians, church members adhere to the commandment of our Lord Jesus Christ to "teach all nations". Therefore, it is within this spirit that the Parish welcomes everyone to pray together. Paskas for you to purchase for your Paschal Basket will be available on Palm Sunday after the Liturgy. 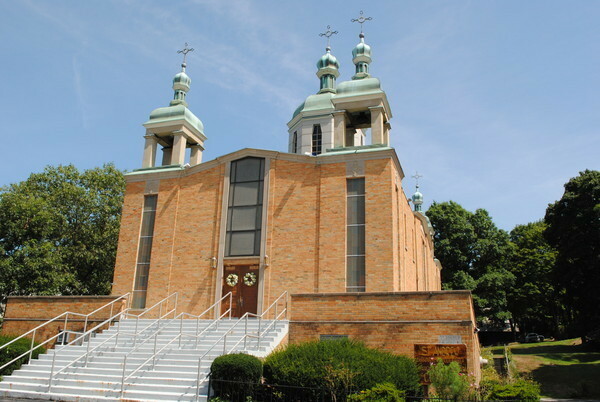 10:00 A.M. Divine Liturgy Noon: SVIACHENE – Pascal Dinner hosted by St. Andrew Ukrainian Orthodox Church of Boston All are welcome! 6 A.M. on Sunday, April 28, 2019. PARKING will be challenging on this day. Please be respectful of our neighbors. 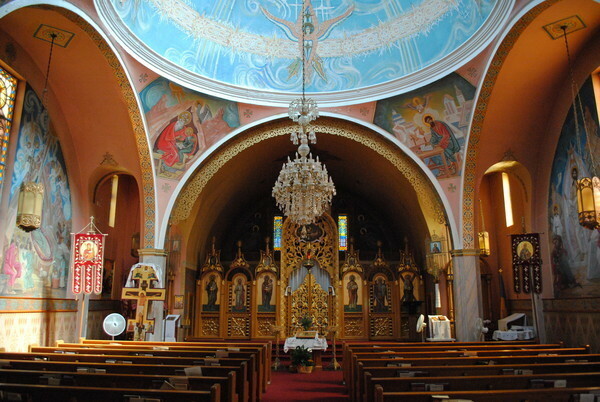 Sunday, May 19, 2019 Please join us at 12:OO P.M. SVIACHENE - Pascal Dinner at St. Andrew’s – All proceeds will go to charity. May the Victorious Christ bless all of us with His kindness and love. May the joy of Jesus Christ’s Resurrection fill our hearts and souls. Christ is Risen! Indeed He is Risen! 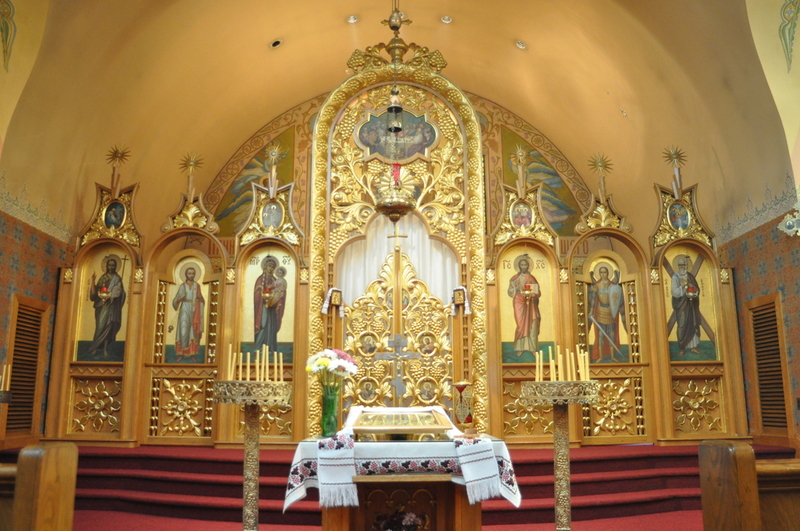 On Sunday, December 9, 2018 His Eminence Metropolitan Antony, accompanied by Subdeacon Mykola Zomchak and seminarian Myroslav Mykytyuk, visited St. Andrew Ukrainian Orthodox Church of Boston. The occasion was the 60th Anniversary of the church edifice and the 40th anniversary of the ordination of its pastor, Very Reverend Roman Tarnavsky. His Eminence was greeted with flowers at the church door by the children of the parish and then welcomed into the church by parish president, Jane Yavarow. In her greeting she stressed that St. Andrew’s was more than just four walls, but a place to ground us, a place to come together to worship as a community, a place to rely on for spiritual health and healing, and a place for us to be the body of Christ. Fr. Roman, along with visiting clergy Fr. 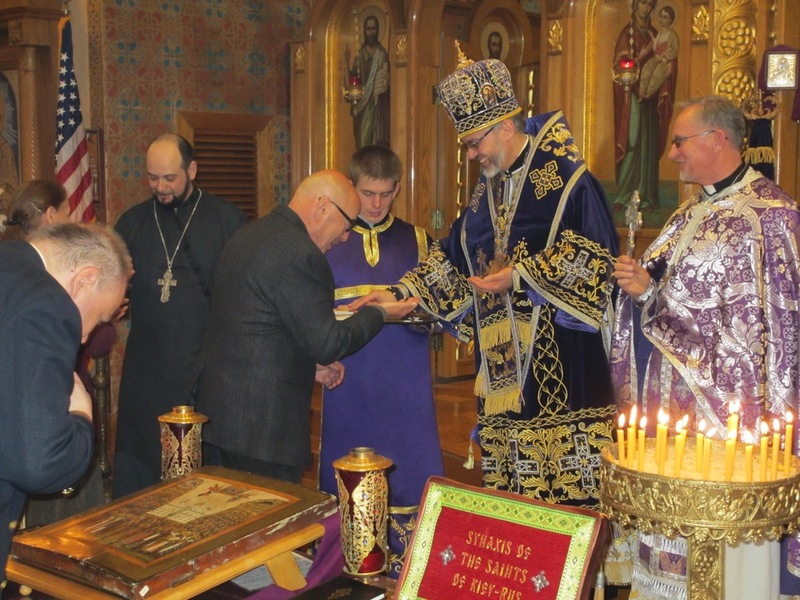 Borislav Kroner, Deacon Paul Cherkas and Deacon Michael Abrahamson all from Woonsocket, RI, ushered His Eminence to the tetrapod where the Hierarchical Divine Liturgy began. St. Andrew’s choir, under the direction of Jane Yavarow offered the responses. At the end of the Liturgy, His Eminence thanked the choir for the beautiful, peaceful and at times moving melodies that they rendered. With the Liturgy completed, there were a few awards to be given out. 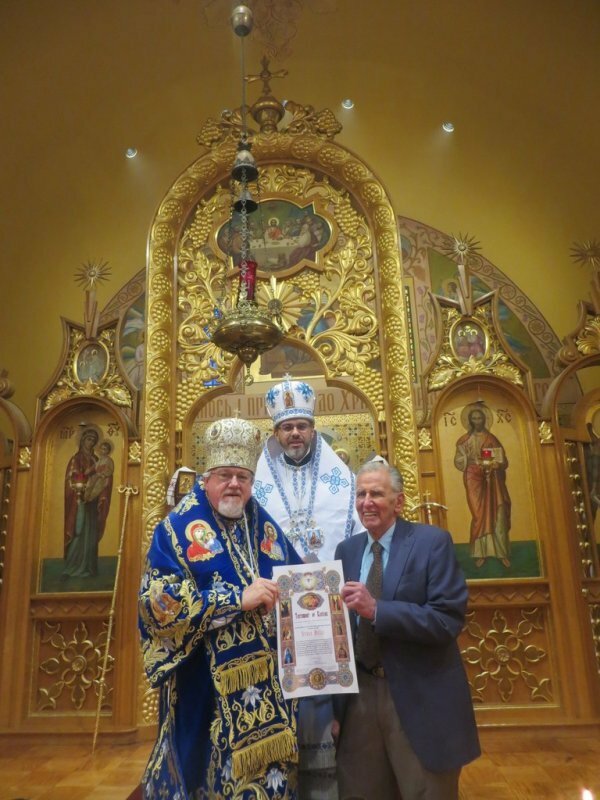 In July, the Ukrainian Orthodox Church of the USA celebrated its 100th anniversary. In honor of the Church’s Centennial Celebration, our hierarchs created a special award of a medal bearing the image of St. Andrew and the X-shaped cross upon which he was crucified along with the Ukrainian and American flags and the centennial “100” insignia. 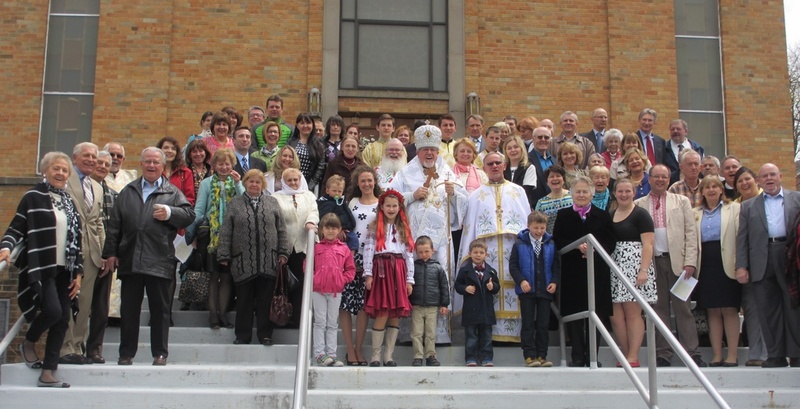 The purpose of this special award is to honor individual parish members, nominated by their pastors and parish boards who have exemplified what it means to be a fully committed Ukrainian Orthodox Christian over a period of at least 15 years in the life of the Church. St. Andrew’s honorees, exemplifying these qualities and more, were Leonid Kondratiuk, Pearl Smith, Iryna Wavariv-Priester, George Wons and Jane Yavarow. Two “hramatas” were also awarded to more recent immigrants, Kateryna Parshikova and Michael Gregory for their dedication to the church. Finally Vladyka Antony summoned the faithful for a group photo, a panoramic view of the parishioners in the beautiful 60 year-old church. After the Liturgy everyone moved to the church hall where they dined on a catered meal featuring lobster bisque, Waldorf salad and baked cod prepared by Chef Michael, a long-time friend of St. Andrew’s. Along with celebrating the 60th anniversary of the church, the parishioners honored their pastor, Right Rev. Roman Tarnavsky, on the 40th anniversary of his ordination to the priesthood. Fr. Roman attended the Odessa Theological Seminary. On September 27, 1978, on the feast day of the Exaltation of the Holy Cross, he was ordained a priest. In 1997, with the prospects of a better life for his two sons, Fr. Roman moved his family to the United States where he began his service in the Ukrainian Orthodox Church of the USA. He was assigned to St. Andrew Ukrainian Orthodox Church of Boston in 2002. Fr. 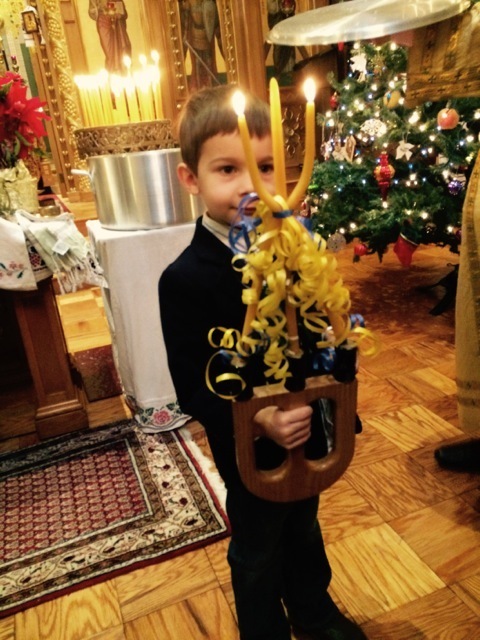 Roman was honored with gifts from the choir, sisterhood and parish. Proclamations were received from the governor of Massachusetts and the city of Boston making it Fr. Roman Tarnavsky Day in the city. The day’s festivities continued with a concert performed by a few of the many talented members of the parish. Cellist Łukasz Pawlikowski and violinist Matt Scutchfield played two numbers followed by singing performances by Michael Hotz, Tetyana Portyankina, Olga Tymoshchuk and Eugene Moroz accompanied on piano by Oksana Oliynyk. Young altar servers Alex Levchuk and Dennis Levchuk, their father Georgiy Levchuk and friend Igor Oliynyk dedicated their rendition of Dva Koljory (Two colors) to Fr. Roman. Their performance brought tears to his eyes and to all those in the audience. To close out the day, Metropolitan offered a few remarks congratulating the parish and encouraging its members to embrace new immigrants and nurture its children to ensure the life of St. Andrew’s for another 60 years. In the spirit of this Lenten season, “LET US BE ATTENTIVE!” (LUBA) is a call to be attentive to our neighbor, to our community, to our parish family and to Christ! 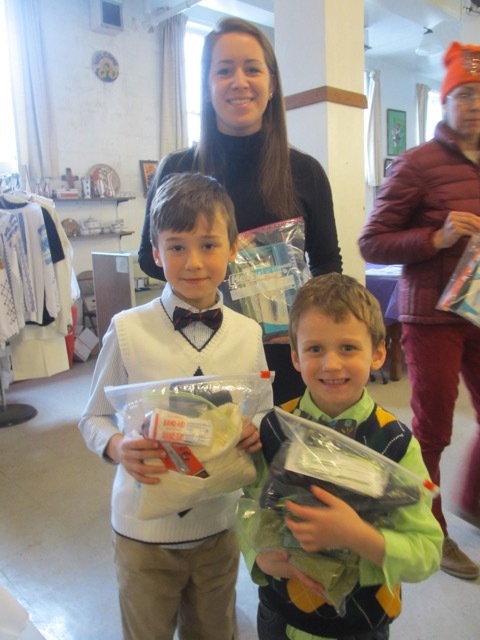 This year, as a Lenten Project, parishioners of St. Andrew Ukrainian Orthodox Church of Boston undertook a charitable activity to assist the International Orthodox Christian Charities (IOCC) in shipping emergency hygiene kits to those in need around the world. Imagine a child being so poor that soap and washcloths are considered luxury items. Imagine being a refugee who has fled from home with only the items he carries in his hands. Imagine being the victim of a natural disaster and losing all of your possessions. 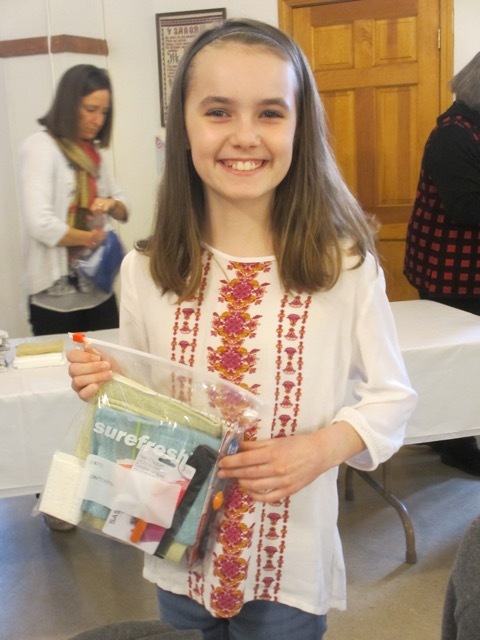 For the faithful of St. Andrew’s, assembling and sending these emergency kits was a practical and tangible way to provide aid and to make life a bit better for those in need. 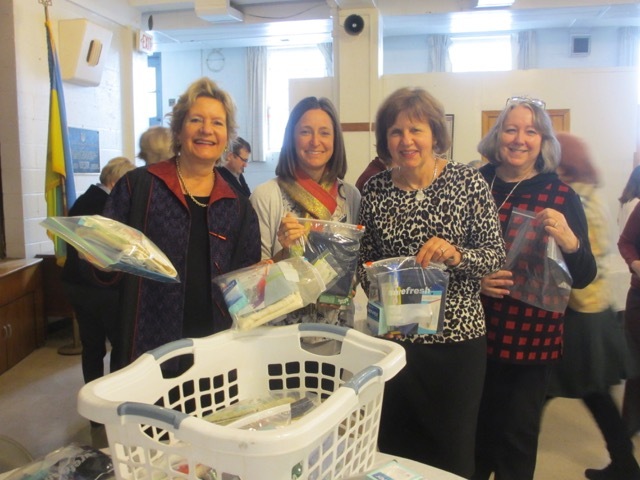 During the first four weeks of Great Lent, parishioners donated items needed to make the hygiene kits including hand towels, washcloths, combs, nail clippers, soap, toothbrushes and Band-Aids. 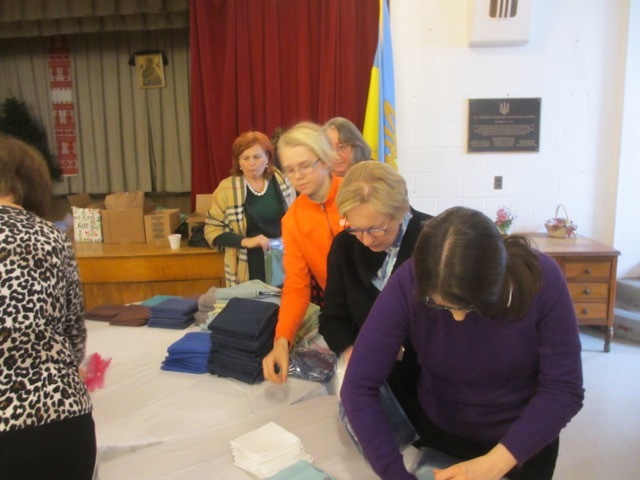 After the Liturgy on Sunday, March 25, 2018 enthusiastic volunteers assembled the items and prepared the kits for shipping. 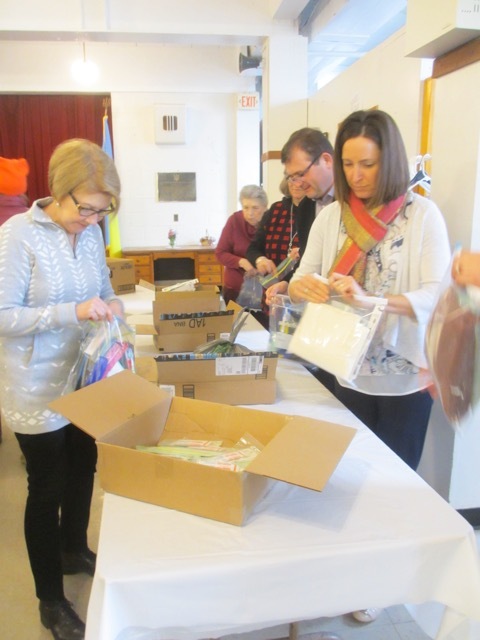 Since this year marks St. Andrew’s 60th anniversary as a parish, donors set a goal of assembling sixty kits for the 60th! As it turned out, 83 kits were assembled, far exceeding the goal. Over this past year, St. Andrew’s has followed the recommendations of the Consistory’s “LUBA” initiative. The Church has made monthly donations to various charities ranging from the American Kidney Foundation to the Greater Boston Food Pantry as well as to the organizations of the UOC of the USA. Assembling the kits was a great next step in getting the parish actively involved in charity work. On Saturday, March 17 and Sunday, March 18, 2018 St. Andrew Ukrainian Orthodox Church of Boston held its annual Lenten Mission with special guest, His Eminence Metropolitan Antony of the UOC of the USA. The Mission began on Saturday evening with Vespers led by Very Reverend Roman Tarnavsky of St. Andrew’s and assisted by visiting clergy, Very Reverend Stephen Masliuk from Bridgeport, CT, Reverend Borislav Kroner and Deacon Paul Cherkas both from Woonsocket, RI. The responses were rendered by Archdeacon Vasyl Janick, Deacon Michael Abrahamson, both from Woonsocket, RI and the choir of St. Andrew’s. After Vespers attendees partook of a Lenten supper prepared by St. Olha’s Sisterhood. Many parishioners contributed their Lenten specialties for all to enjoy. Dinner was followed by the highlight of the evening, a Lenten talk by Vladyko Antony. His Eminence used the penitential prayer of the Judean king, Manasseh, as the basis of the first part of his talk. “…I bow the knee of my heart, beseeching thee for grace. I have sinned, O Lord, I have sinned, and I acknowledge mine iniquities; but I humbly beseech thee, forgive me, O Lord, forgive me, and destroy me not with mine iniquities. Be not angry with me for ever, by reserving my evils for me; neither condemn me to the lower parts of the earth; for thou, O Lord, art the God of them that repent; and in me wilt thou show all thy goodness; for thou wilt save me that am unworthy, according to thy great mercy. And I will praise thee henceforth all the days of my life…” Through the exploration of this prayer, Vladyko reminded those in attendance of the way we can all seek atonement as we humbly ask God’s forgiveness. His Eminence’s talk was thought provoking and well received, a good prescription for those 40 guests in attendance seeking to be spiritually uplifted during Great Lent. On the following day, Sunday, March 18, 2018, His Eminence Metropolitan Antony celebrated a Hierarchical Divine Liturgy for the faithful of St. Andrew Ukrainian Orthodox Church of Boston. He was welcomed with flowers presented by the children of the parish and greeted with bread and salt by Jane Yavarow, Parish Board President. Pastor of St. Andrew’s, Fr. Roman Tarnavsky, presented him with the cross and asked for his blessing. From the first “God, Grant you Many Years, Master!” to the final “Amen,” responses were beautifully rendered by the dedicated 18 member church choir under the direction of Jane Yavarow. During Vladyko Antony’s sermon he emphasized the importance of praying the prayer of St. St. Ephraim not only during Great Lent but every day as a guideline for the way we shoould live our daily lives. After the Liturgy, all were treated to a Lenten Luncheon prepared by St. Olha’s Sisterhood under the leadership of co-presidents Vera Geba and Valentina Dingle. 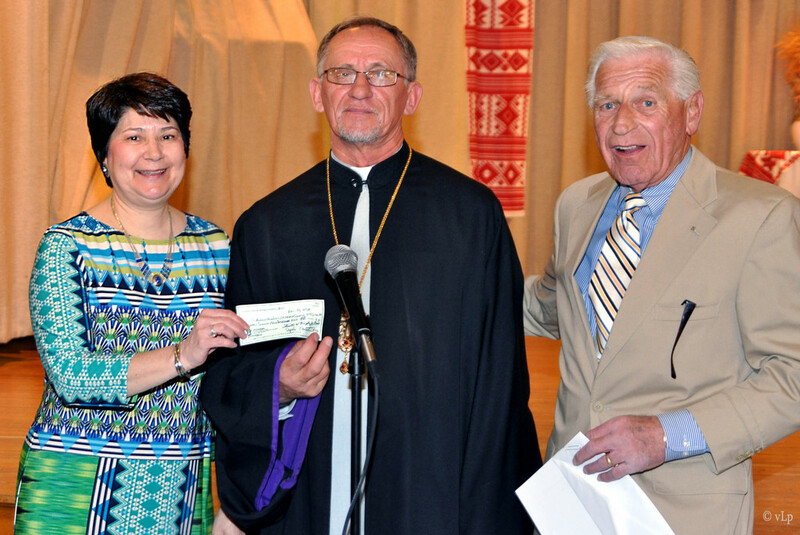 At the conclusion of the dinner, a donation of $1,000, raised from Lenten soup sales and funds from the Parish Board and Sisterhood, was presented to Vladyko Antony to be used for the wonderful work our Consistory does to support orphanages in Ukraine. As the day drew to a close, many of the faithful, filled with a renewed spirit divined from the Lenten Mission, came forward to seek the blessing of His Eminence. Risen! Indeed He is Risen! 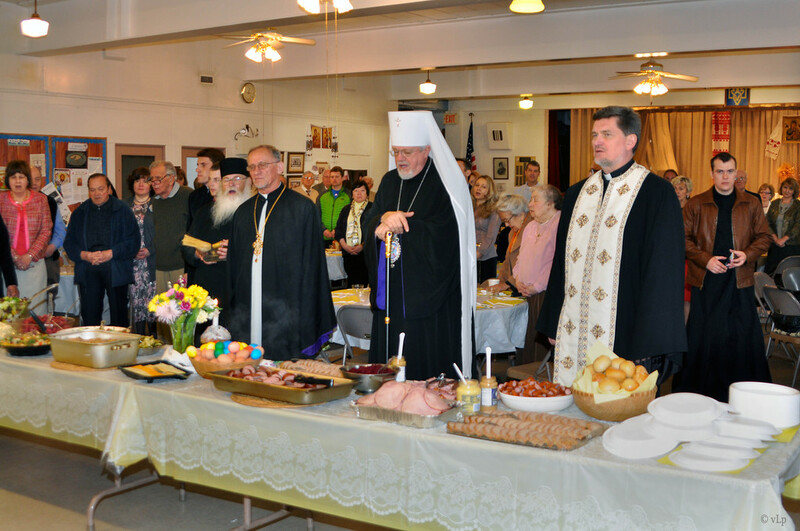 On April 16 & 17, 2016, St. Andrew Ukrainian Orthodox Church of Boston held its annual Lenten Mission. The parish was extremely fortunate to have His Grace, Bishop Daniel, as its guest for the weekend. 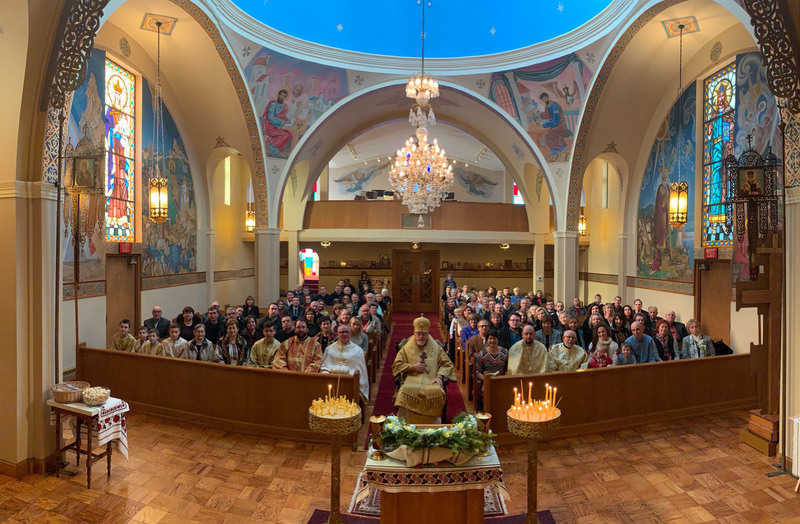 On Saturday evening, parishioners as well as visitors from St. Michael’s in Woonsocket, RI and other local Orthodox parishes gathered to worship together. As His Grace Bishop Daniel heard confessions, Fr. Borislav Kroner, assisted by Deacon Paul Cherkas and altar servers Alexis Levchuk and Dennis Levchuk celebrated Great Vespers. Responses were offered by Fr. Roman Tarnavsky, Deacon Michael, Hierodeacon Vasyl, and seminarians Ihor Protsak and Mykola Zomchak, as well as members of the choir of St. Andrew’s. The church, bathed in evening candlelight, was the perfect setting for this beautiful service. At the conclusion of Vespers, Bishop Daniel began the Lenten Mission in earnest by putting on his teaching hat. Via Villanova University, and on loan to Bishop Daniel through the weeks of Great Lent, he brought with him a set of 12 saintly relics from the Pecherska Lavra in Kiev encased in a box labeled, “Synaxis of the Saints of Kiev-Rus” as well as a 16th Century icon of the Venerable Fathers of the Monastery of Kyiv Caves. He used these physical items to prompt the faithful into contemplating who is a saint, and just how does one become saintly? After this mini-lesson, all in attendance gathered in the church hall for a light Lenten Supper prepared by members of St. Olha’s Sisterhood. Following the meal, Bishop Daniel again took to the floor to speak on his theme for the evening, “Enter to Worship, Exit to Serve.” Through his talent for storytelling and use of humor, His grace made it most clear that living a fulfilling and meaningful Christian life does not simply mean attending church on Sunday, but more importantly, how you serve other people day to day. He stressed that we must step outside our comfort zone to do things for others, so that they feel the love and presence of Christ that we have within us and want to share with them. His presentation was an extremely powerful reminder of what we should be doing during Great Lent, so that in the future, it becomes part of our everyday life. 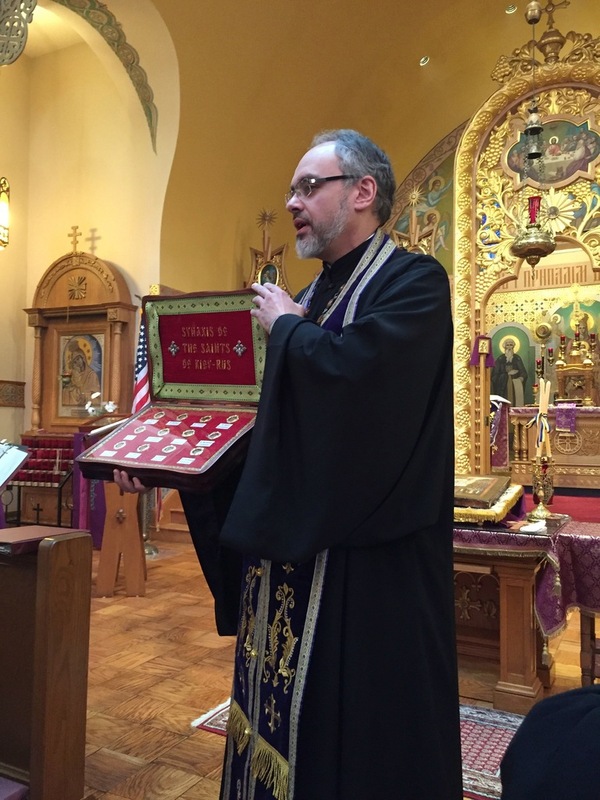 On Sunday morning His Grace celebrated the Hierarchical Divine Liturgy at St. Andrew’s. He was greeted with flowers by flower girl Maria Custodio, bread and salt by Parish Board President, Jane Yavarow and the holy cross by St. Andrew’s pastor, Roman Tarnavsky. From the first “God, Grant you Many Years, Master!” to the final “Amen,” responses were beautifully rendered by the dedicated 20 member church choir under the direction of Jane Yavarow and Eugene Moroz. In keeping with the idea of a Lenten Mission, Vladyka aptly took time out during the Liturgy to educate the faithful about what was happening. He explained the history of why we pray for the Catechumens. He had us experience the lost tradition of offering the “Kiss of Peace” to our church family members, and had the congregation recite the Nicaean Creed together as one united body. Finally, before it was consecrated into the body of Jesus, he brought down from the altar the portion of the Prosphora called the Ahnec, or the Lamb, which represents our Lord who takes on the sins of the world. He showed us how this would be portioned out for communion. Bishop Daniel’s thoughtful bilingual sermon challenged us with a question. “What would you ask of Jesus if he stood before you today?” Again he tied this in with the idea of serving, suggesting that we should not ask for things for ourselves, but for the greater humanity. After the extraordinary three-hour Liturgy, all were invited to partake in a Lenten luncheon buffet coordinated by project manager, Vera Geba. Many generous parishioners donated their favorite Lenten dishes for all to enjoy. To conclude the Lenten Mission, Bishop Daniel filled the attendees in on what is happening at the Consistory regarding the Church’s strategic plan for the future. He also encouraged individuals to think about church camp for the youth and mission work for young adults. He spoke specifically about the opportunity to serve in the orphanages the Ukrainian Orthodox Church of the USA sponsors in Ukraine. It was apropos then, at this time, that Vera Geba, Co-President of St. Olha’s Sisterhood, presented Bishop Daniel with a $1,000 check for the orphanages - $300 from a fundraiser run by the youth of the parish and $700 from the Sisterhood. For this, His Grace was very grateful. St. Andrew’s Lenten Mission, on all levels, proved a great success. We thanked His Grace for inspiring us as we move through the last weeks of Great Lent into Holy Week and then to Pascha, the ultimate celebration of the Resurrection of our Lord and Savior. Thank you to all who supported our St. Andrew’s Youth Group “Souper Bowl” Sunday activity last week. They raised $300. 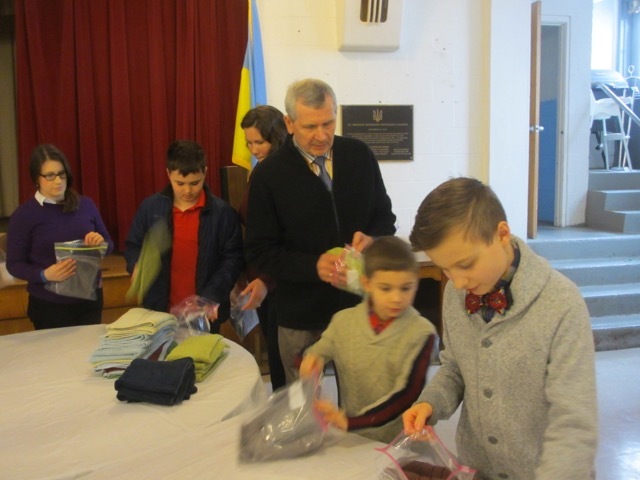 All donations will be sent to the Saint Andrew’s Society to feed the hungry in Ukraine. 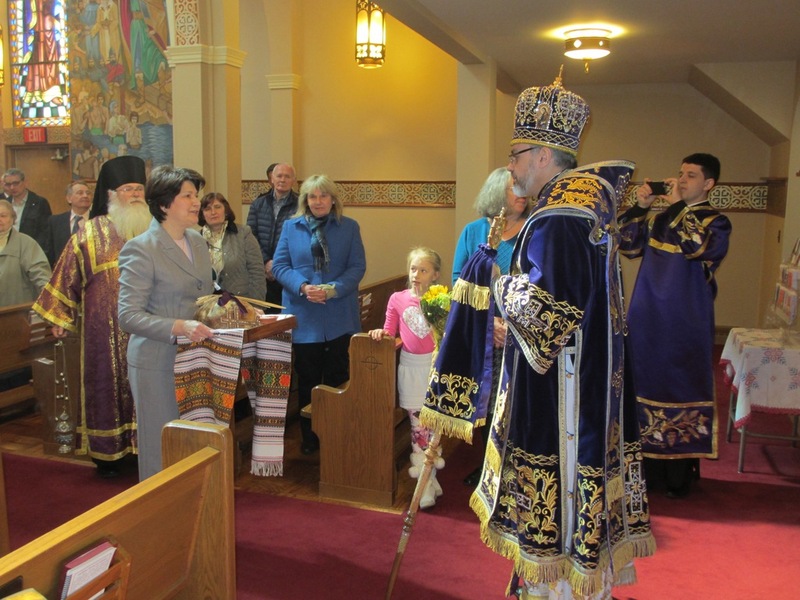 On Sunday, April 26, 2015, St. Andrew Ukrainian Orthodox Church of Boston was honored to have a visit from His Eminence Metropolitan Antony. The Metropolitan was greeted with flowers by the children of the parish, bread and salt by Parish Board President, Jane Yavarow and the holy cross by Fr. Roman Tarnavsky. With the intoning of “Christ is Risen” he began the Hierarchical Divine Liturgy. Responses were offered by the dedicated members of the parish choir. At the conclusion of the Liturgy, Metropolitan Antony invited everyone outside for a group photo. 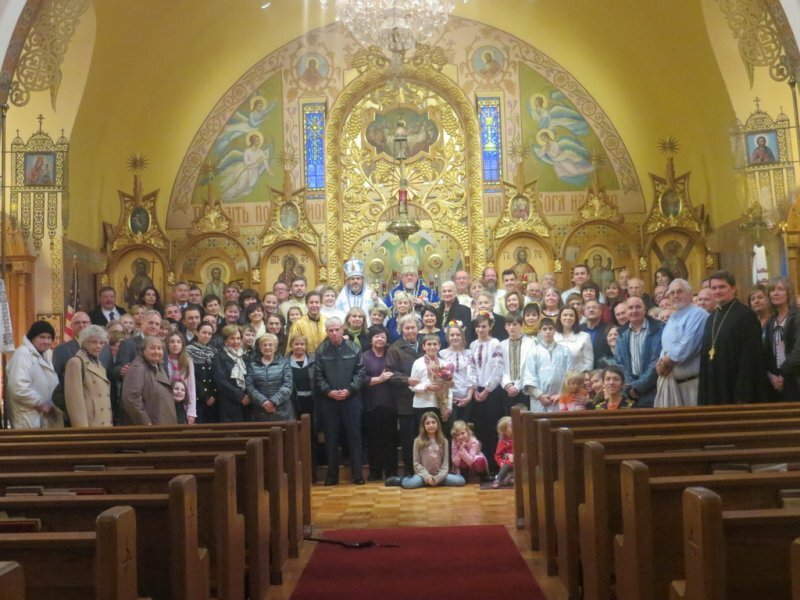 It is the tradition at St. Andrew’s to celebrate, Sviachene - the post-Paschal dinner - two weeks after Pascha together with members of Christ the King Ukrainian Catholic Church of Boston. Fr. Yaroslav Nalysyk and his parishioners joined St. Andrew’s parish to partake of a delicious meal prepared by the members of the church and coordinated by project manager, Iryna Warvariv-Priester. After the meal, Metropolitan Antony served a Panahyda to mark the anniversary of the tragic events in Chernobyl 29 years ago. May their memory be eternal. Before the conclusion of the dinner, the President of the Ukrainian American Heritage Foundation, Walter Boyko, and its Board of Directors, made a very generous gift to St. Andrew’s. A plaque, noting this donation, was installed in the church hall and will be a reminder of their great kindness. Metropolitan Antony blessed the plaque and prayed for the good health of the members of the Foundation. Then His Eminence blessed the faithful with a heavy sprinkling of holy water and offered best wishes to all for many, many happy years! 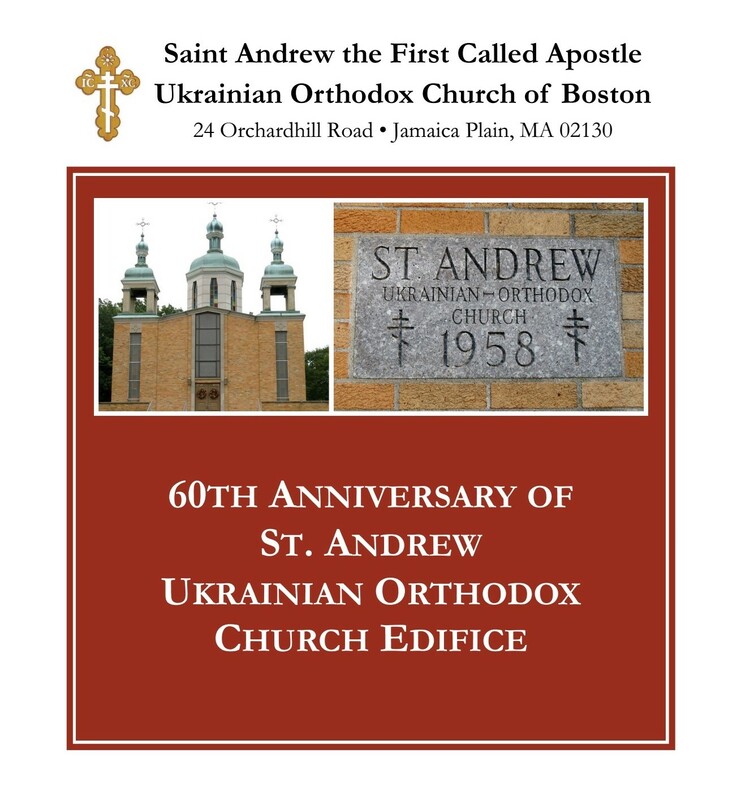 On Sunday, December 1, 2013, the Parish of Saint Andrew the First Called Apostle Ukrainian Orthodox Church welcomed His Eminence Metropolitan Antony and His Grace Bishop Daniel to Boston. They were invited by the parish to celebrate our Patron Saint’s Day and to bless the renovated and restored interior of our 60-year-old edifice. Our Hierarchs were presented with flowers by the children of the parish and greeted with the traditional bread and salt by parish president, Jane Yavarow. Very Reverend Roman Tarnavsky, pastor of the church, offered them the cross. Thus began a many faceted morning. The blessing service took place first. 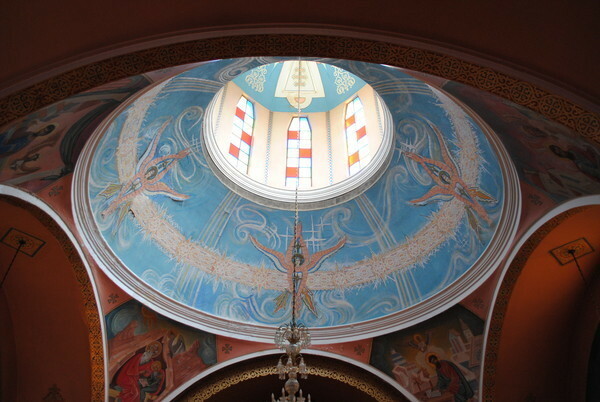 The Hierarchs walked throughout the church sprinkling holy water on the newly painted walls. Bishop Daniel took great pleasure in dousing choir members as they sang, “Oh, Lord, Save Thy People”. 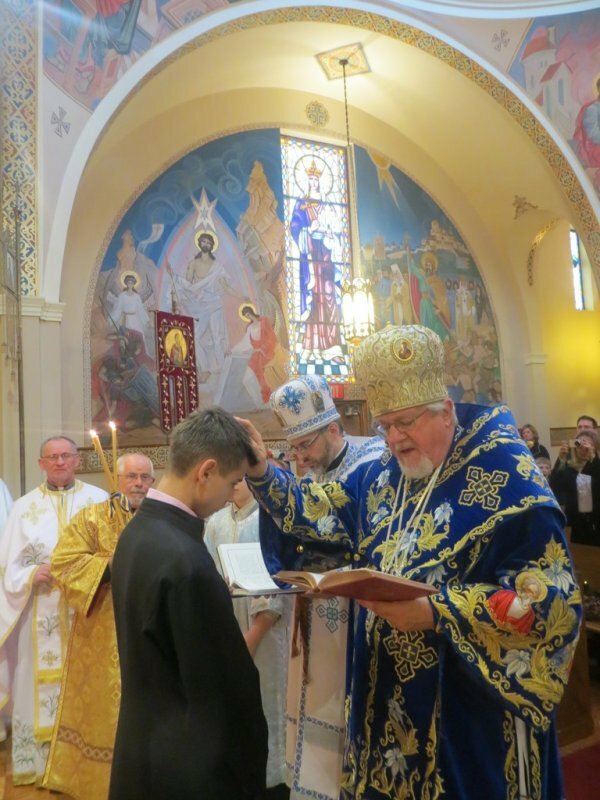 Next, 17 year old Sviatoslav Kotyk, was ordained a sub-deacon. Originally from Ukraine, Sviat is an altar server and reads the Sunday epistle regularly in both English and Ukrainian. Metropolitan Antony reminded him of the importance of the reader who must prepare weekly to fully understand what he is reading and to impart it with conviction. 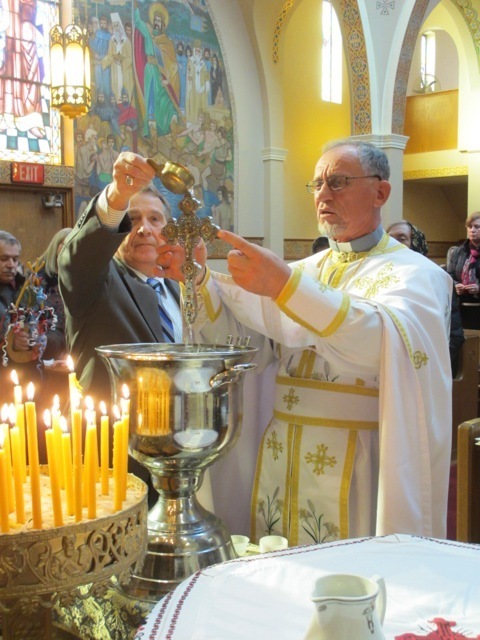 After these services, the bilingual Hierarchical Divine Liturgy began. Serving with our Hierarchs and Fr. Roman were Fr. Anthony Perkins from Woonsocket, RI and Hierodeacon Vasyl from Boston. Seminarian Adrian Mazur joined them from St. Sophia’s Seminary. Metropolitan Antony offered an insightful sermon revolving around the word restoration, not only in the physical sense, but also most importantly, in the spiritual sense. Bishop Daniel offered an especially meaningful prayer for Ukraine in light of the turmoil she has endured in the past and is being confronted with today. Before the dismissal, a “Testament of Blessing” was bestowed on four of the faithful parishioners of the church: Valentina Dingle and Vera Geba, co-presidents of St. Olha’s Sisterhood, Eugene Moroz, choir director and Jane Yavarow choir director and parish president. This was a surprise and great honor to all who received this blessing. At the conclusion of the Liturgy, Metropolitan Antony called all of the faithful to the front of the church for a group picture. While the Liturgy was going on upstairs, a delicious banquet of lobster bisque and baked sole was being prepared by Chef Michael Maggiani, and parishioners Len Kondratiuk, Mark Walling, George Wons, and Dan Smith. Over 130 guests were in attendance in the hall beautifully decorated by Tanya Tereshko-Little. Between the first two courses, mistress of ceremonies, Iryna Warvariv-Priester, directed the audience to the stage to view a welcoming dance by the Ukrainian dance ensemble ISKRA from NJ under the direction of Andrij Cybyk. They performed a number of other dances during the afternoon ending with a lively and crowd rousing hopak. The crowd was also entertained by local talent Sophia Raniuk who performed a piano medley of Ukrainian songs. She then accompanied bass singer Eugene Moroz as he preformed two Ukrainian folk songs. Jane Yavarow, parish president, welcomed all in attendance and thanked those who contributed to the Restoration Fund. She acknowledged Fr. Roman Tarnavsky and Iryna Warvariv-Priester with whom she worked to fulfill the goals of the Church Restoration Committee. Valentina Dingle, Vera Geba and Pearl Smith were thanked for their contributions, as well. The day was rounded out with a birthday celebration to honor Joseph Charyna on his 100th birthday. Metropolitan Antony presented him with a “Testament of Blessing”, and birthday wishes from President Barack Obama and Massachusetts Governor Deval Patrick. Joseph joins Mary Wons and Mary Schlitz who, in June, both turned 100 years old. Our parish is blessed to have three parishioners in the “Century Club”. St. Andrew’s Day 2013 was a memorable and joyous occasion for all who worshipped together, broke bread together and shared in the very special fellowship found at our parish.